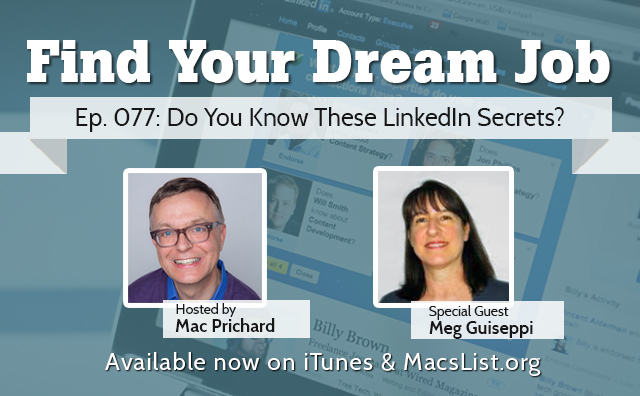 A few months ago I did a podcast with Mac Prichard (@Mac_Prichard on Twitter) on LinkedIn, personal branding and executive job search — as part of his “Find a Dream Job” series. Listen to the podcast on YouTube. The podcast begins with discourse between Mac and his associates Ben Forstag and Jessica Black, as they tackle the Listener Question of the Week, before my interview with Mac begins. And you’ll find the full transcript of the podcast on the same page. LinkedIn has so many different options, and having a complete profile we know is important. Let’s go through some of those features. There’s some sections that aren’t used very often. What comes to mind are organizations, or honors and awards. How can using a section like that help someone? One thing we haven’t really touched on is Search Engine Optimization, which is all about using the right keywords and keyword phrases – and plenty of them – in your profile to help boost your search engine ranking with LinkedIn. What that means is that when people search those particular relevant keywords and phrases on LinkedIn, if your rankings are higher, then your profile is going to land higher in those search results, which means more people will see your profile. Using those extra sections – organizations, honors, awards, and others – gives you an opportunity to get more of those relevant keywords into your profile, so that makes you more findable. That’s not a good way to think. If they don’t want to read the whole thing, they won’t read it all, but your profile will be there working passively for you, helping you with Search Engine Optimization. More content means more keywords and better visibility and findability. It just makes sense to fill out your profile with as much content as you can do, packing it with those relevant keywords so that LinkedIn is working for you passively, beyond the proactive way you need to be using the many features LinkedIn has to offer. Yes, the Pulse Publishing Platform, which I still find many people are unaware of. It’s a very powerful tool to use and, in effect, it’s like having your own blog or blog site, but without the hassles you’ll have maintaining a blog site of your own. On Pulse, you publish articles about your areas of expertise, which helps to position your subject matter expertise and thought leadership, and gives people more information about you. That’s only going to help you. People are searching online once you become someone of interest to them. They’ll be searching your name, looking for information about you, and the more information they find, the stronger your online presence, and the more valuable it makes you appear to be as a candidate. The other thing about using Pulse and LinkedIn’s other publishing opportunities – sharing updates, commenting on other peoples Pulse articles and updates, etc. 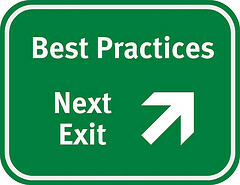 – is that they keep you top-of-mind with your network, which is an important part of job search strategy. Reminding people of the value you offer and what your brand is all about, so that when leads and opportunities come their way, they’ll think of you and hopefully connect you with that opportunity. These LinkedIn publishing opportunities are a gentle way to stay top-of-mind, as opposed to reaching out to people one-on-one and networking with them . . . things you need to be doing too, but which introverts and others may have a difficult time doing. In the time allotted for the podcast, I didn’t get the chance to cover all the ground I’d hoped to. 1. Leaving the default LinkedIn professional headline, which is your current job title. 2. No profile photo, or an unprofessional one. 4. Needing to keep their executive job search confidential, while still using LinkedIn to their full advantage. The post LinkedIn Personal Branding Secrets for Executive Job Search appeared first on Executive Resume Branding.